The United States Navy recognizes October 13, 1775, as the date of its official establishment, when the Continental Congress passed a resolution creating the Continental Navy. 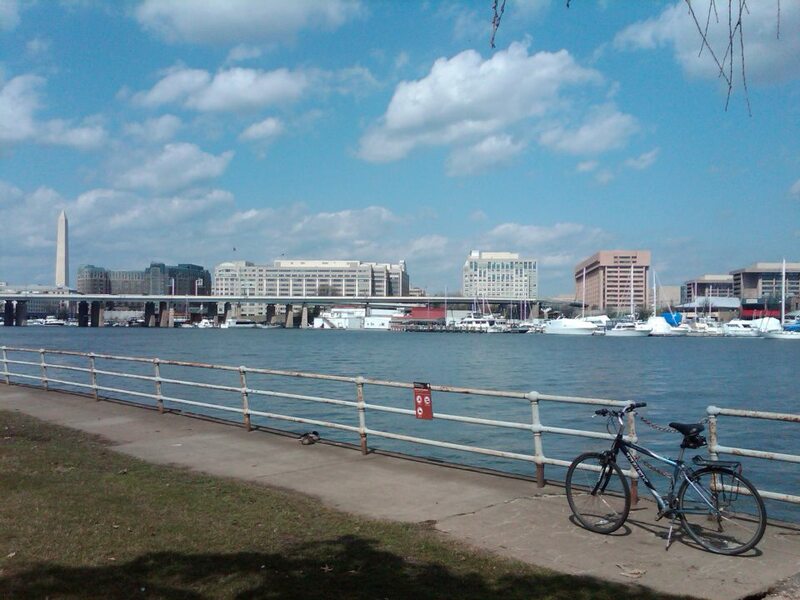 So to celebrate the upcoming 239th birthday of the Navy, on this bike ride I decided to ride to the Washington Navy Yard, which is located in and takes up approximately half of the Near Southeast neighborhood on the Anacostia River (MAP) in Southeast D.C. 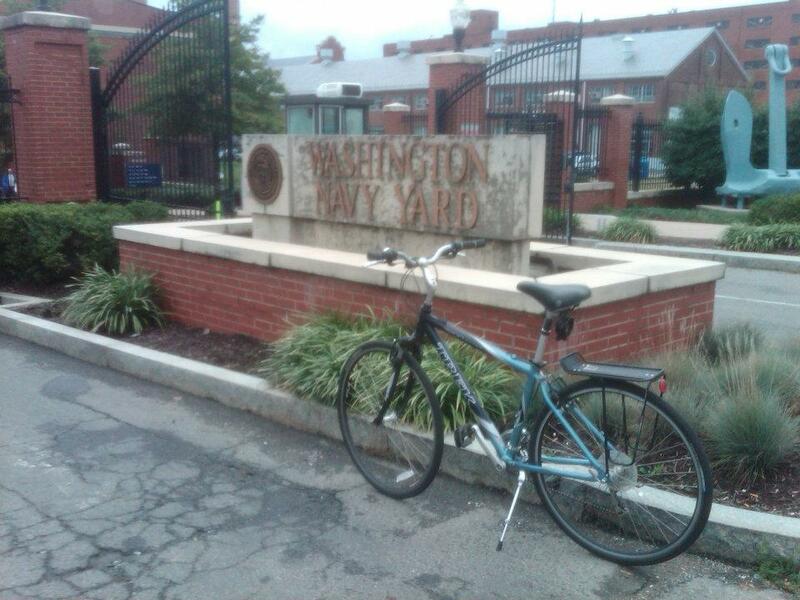 The Washington Navy Yard, or The Yard is it is often referred to, was established in October of 1799. The Yard was built under the direction of Benjamin Stoddert, the first Secretary of the Navy, under the supervision of the Yard’s first commandant, Commodore Thomas Tingey, and is the oldest shore establishment of the U.S. Navy. It was formerly the shipyard and ordnance plant of the U.S. Navy. From its first years, the Washington Navy Yard became the navy’s largest shipbuilding and shipfitting facility, with 22 vessels constructed there. The Yard currently serves as a ceremonial and administrative center for the U.S. Navy, home to the Chief of Naval Operations, and is headquarters for the Naval Sea Systems Command, Naval Historical Center, the Department of Naval History, the U.S. Navy Judge Advocate General’s Corps, Naval Reactors, Marine Corps Institute, the United States Navy Band, and other more classified facilities. 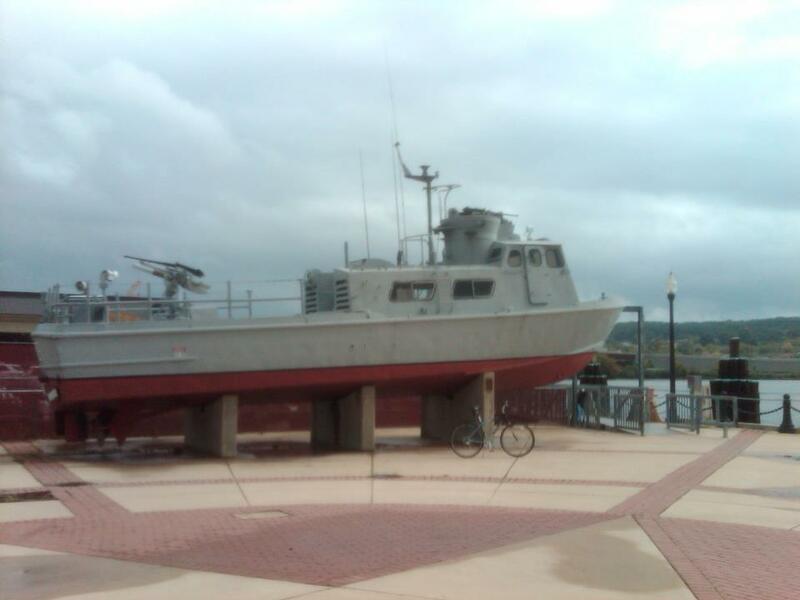 The Yard also includes the Navy Museum which houses the Navy Art Collection and its displays of naval art and artifacts that trace the Navy’s history from the Revolutionary War to the present day. 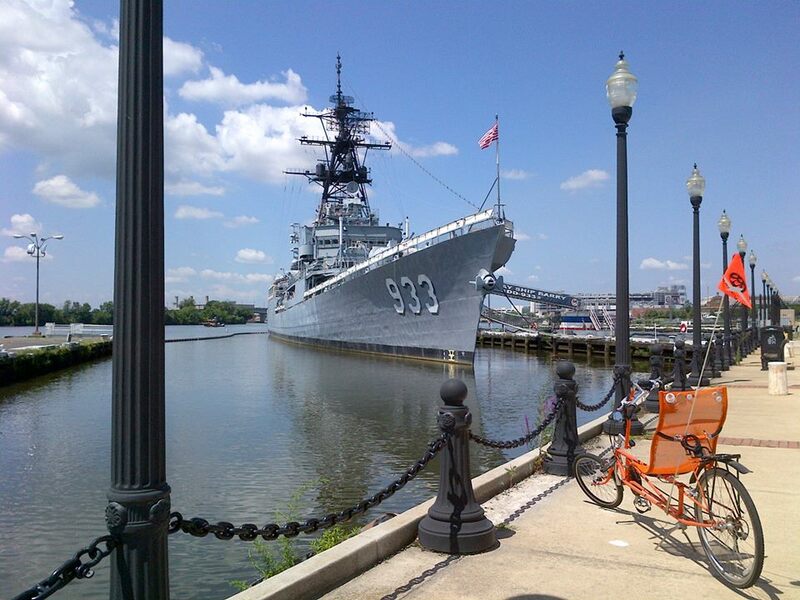 A museum ship, the destroyer USS Barry, is also at The Yard and is open to tourists. The Barry is frequently used for change of command ceremonies for naval commands in the area. The Yard is just one of 42 Navy bases in the United States, with a number of other bases overseas, either in U.S.-controlled territories or in foreign countries under a Status of Forces Agreement. A large number of bases and installations are needed to support the Navy’s size, complexity, and international presence of the Navy’s personnel and operations. The U.S. Navy is the naval warfare service branch of the U.S. Armed Forces, and one of the seven uniformed services of the United States. The U.S. Navy is the largest in the world; its battle fleet tonnage is greater than that of the next 13 largest navies combined. It operates 289 deployable battle force ships and more than 3700 operational aircraft. The U.S. Navy also has the world’s largest carrier fleet, with 11 in service, one under construction, two planned, and one in reserve. The service currently has 325,143 active duty personnel and 107,524 in the Navy Reserve. It operates 286 ships in active service and more than 3,700 aircraft. It also has approximately 201,000 Navy Department civilian employees. So in recognition of the Navy’s upcoming anniversary, I’d like to say happy birthday to the Navy, and to all those who have and are serving. 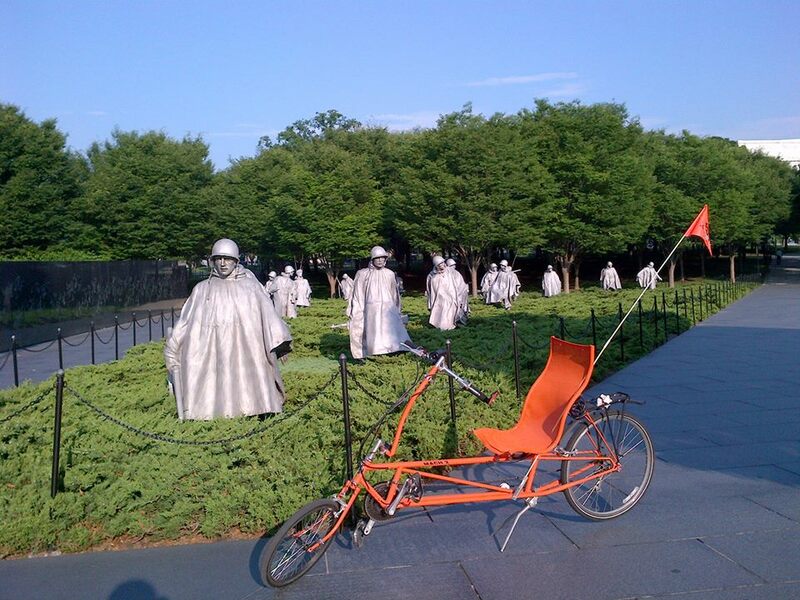 On this ride Julius and I went to one of D.C.’s “major” memorials, the Korean War Veterans Memorial. 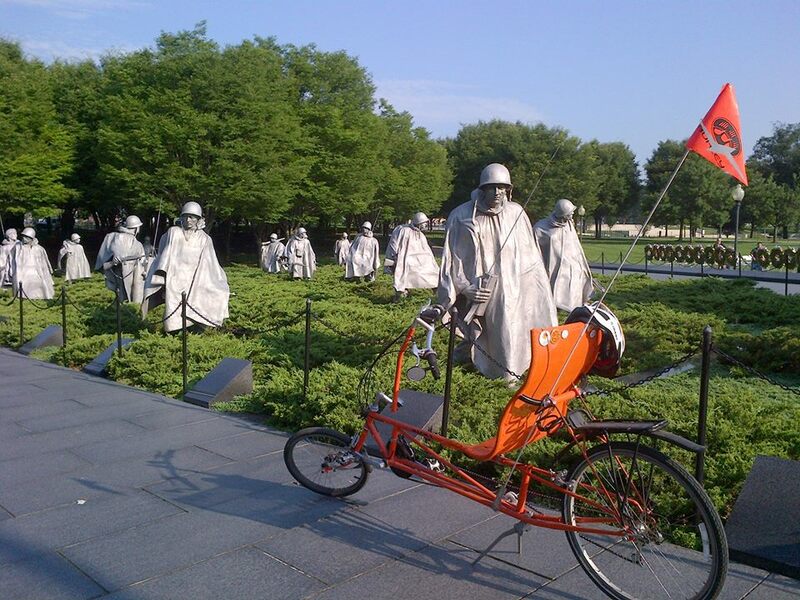 Located in southwest D.C.’s West Potomac Park, just south of The Reflecting Pool on the National Mall (MAP), the memorial commemorates the sacrifices of the 5.8 million Americans who served in the U.S. armed services during the three-year period of the Korean War. On June 25, 1950, North Korean military forces surprised the South Korean army, and the small U.S. force stationed in the country, and quickly headed toward the capital city of Seoul. The U.S. responded by pushing a resolution through the United Nations Security Council calling for military assistance to South Korea. The Soviet Union was not present to veto the action as it was boycotting the Security Council at the time. With this resolution in hand, President Harry Truman rapidly dispatched U.S. land, air, and sea forces to Korea to engage in what he termed a “police action.” The U.S. intervention turned the tide, and U.S. and South Korean forces marched into North Korea. This action, however, prompted the massive intervention of communist Chinese forces in late 1950. The war in Korea subsequently bogged down into a bloody stalemate. On July 27, 1953, the U.S. and North Korea signed a cease-fire that ended the conflict. The cease-fire agreement also resulted in the continued division of North and South Korea at just about the same geographical point as before the conflict. The Korean War was the first “hot” war of the Cold War. Korea was the first “limited war,” one in which the U.S. aim was not the complete and total defeat of the enemy, but rather the “limited” goal of protecting South Korea. For the U.S. government, such an approach was the only rational option in order to avoid a third world war and to keep from stretching finite American resources too thinly around the globe. It proved to be a frustrating experience for the American people, who were used to the kind of total victory that had been achieved in World War II. The public found the concept of limited war difficult to understand or support and the Korean War never really gained popular support. The war was one of the most hard-fought in American history. 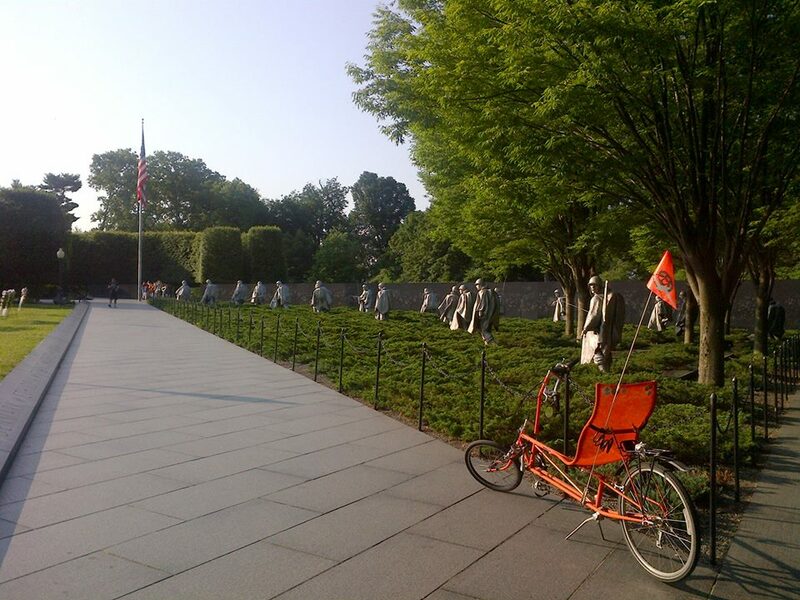 During its relatively short duration, 54,246 Americans died in support of their country. Of these, 8,200 are listed as missing in action or lost or buried at sea. An additional 103,284 Americans were wounded during the conflict. An estimated 2.5 million civilians were also killed or wounded. 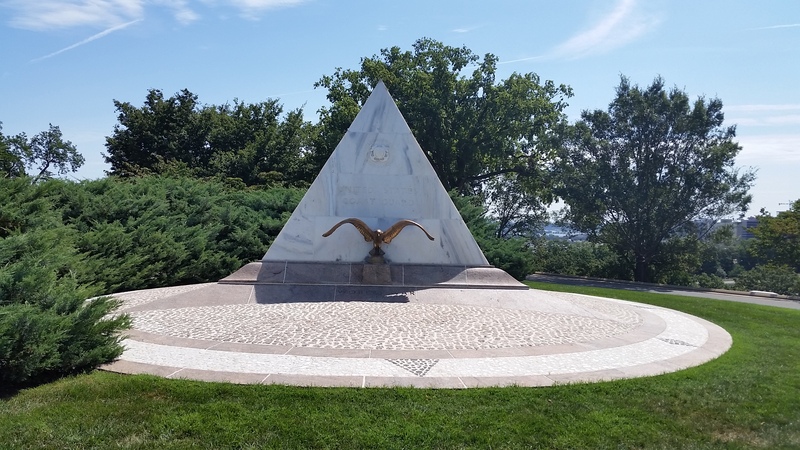 The main portion of the memorial honoring these men and women is in the form of a triangle intersecting a circle. 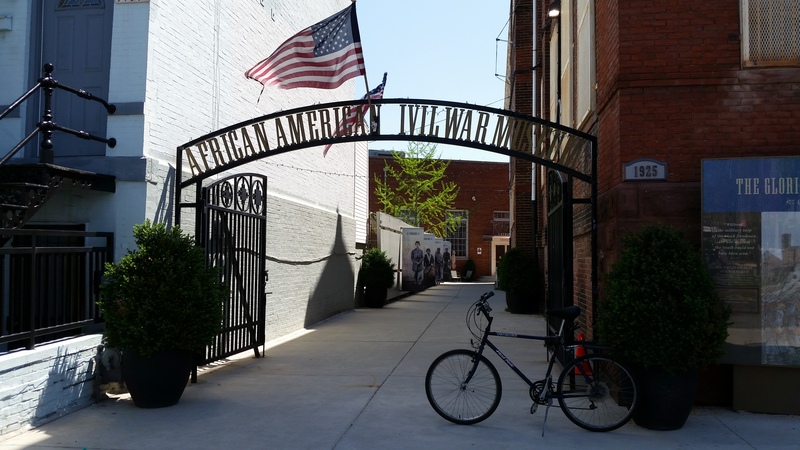 Within the walled triangle are 19 stainless steel statues, which represent an ethnic cross section of America. Each statue is larger than life-size, measuring between 7 feet 3 inches and 7 feet 6 inches tall, and weighing nearly half a ton. The figures represent a squad on patrol, drawn from each branch of the armed forces; fourteen of the figures are from the U.S. Army, three are from the Marine Corps, one is a Navy Corpsman, and one is an Air Force Forward Air Observer. They are dressed in full combat gear, dispersed among strips of granite and juniper bushes which represent the rugged terrain of Korea. The main reflection wall along the south side of the triangle is 164 feet long, 8 inches thick; and made from more than 100 tons of highly polished “Academy Black” granite. 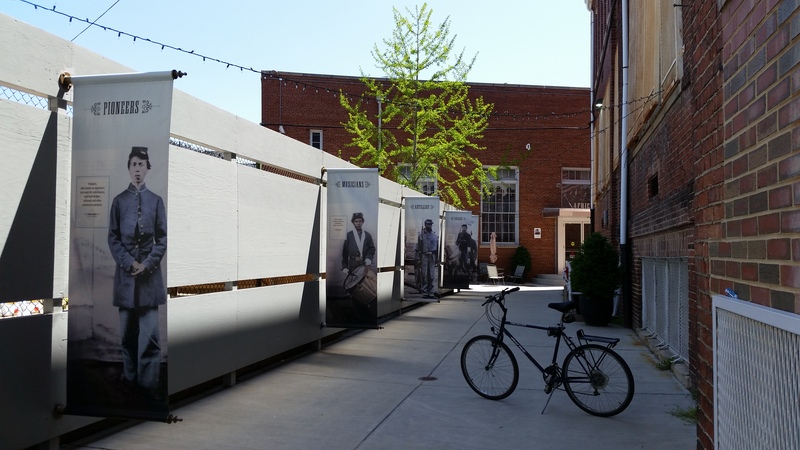 More than 2,500 photographic, archival images depicting soldiers, equipment and people involved in the war are sandblasted onto the wall. 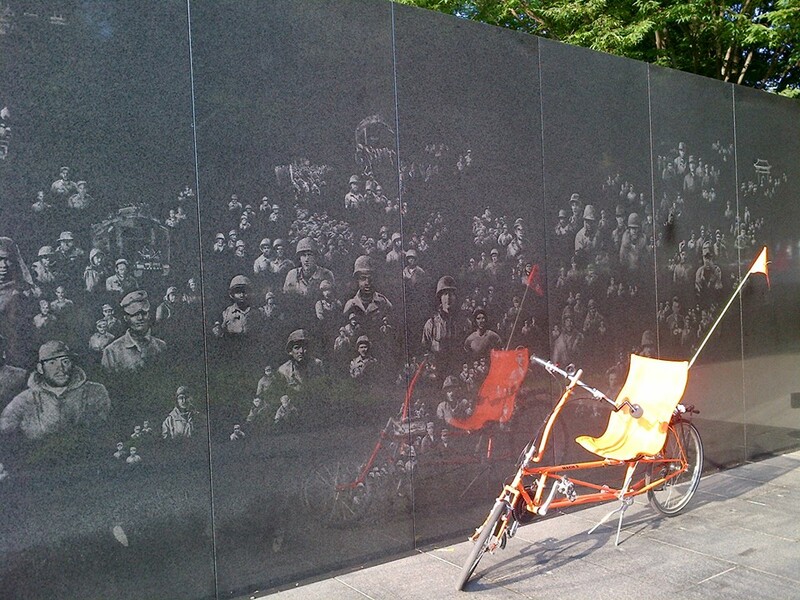 When the statues are reflected on the wall, there appear to be 38 soldiers, representing the 38th parallel. To the north of the statues is a path, forming another side of the triangle. Alongside the path, forming the second side of the triangle is the United Nations Wall, a low wall listing the 22 members of the United Nations that contributed troops or medical support to the Korean War effort. The third side of the triangle, facing towards The Lincoln Memorial, is open. The memorial’s circle contains the Pool of Remembrance, a shallow pool 30 feet in diameter lined with black granite and surrounded by a grove of linden trees with benches. 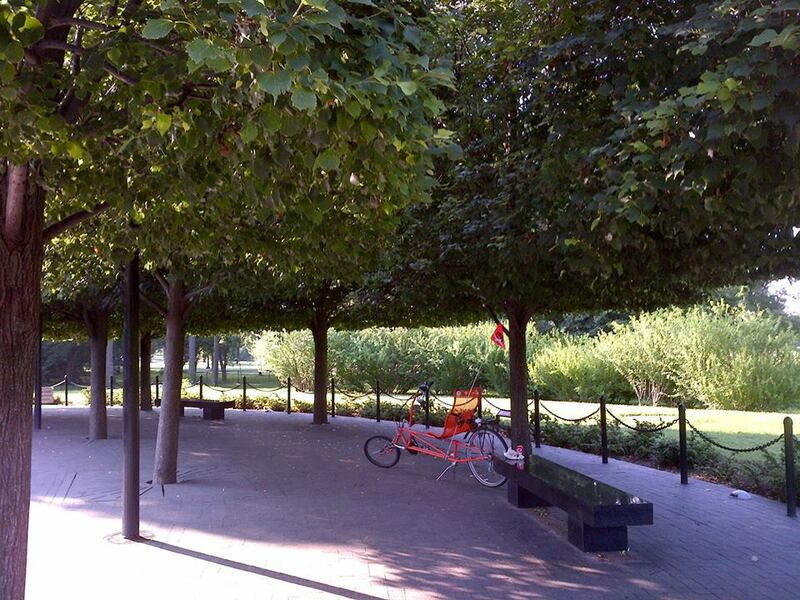 The trees are shaped to create a barrel effect, which allows the sun to reflect on the pool. Inscriptions list the numbers killed, wounded, missing in action, and held as prisoners of war, and a nearby plaque is inscribed: “Our nation honors her sons and daughters who answered the call to defend a country they never knew and a people they never met.” Additionally, next to the information about the American soldiers is information about the United Nations troops. 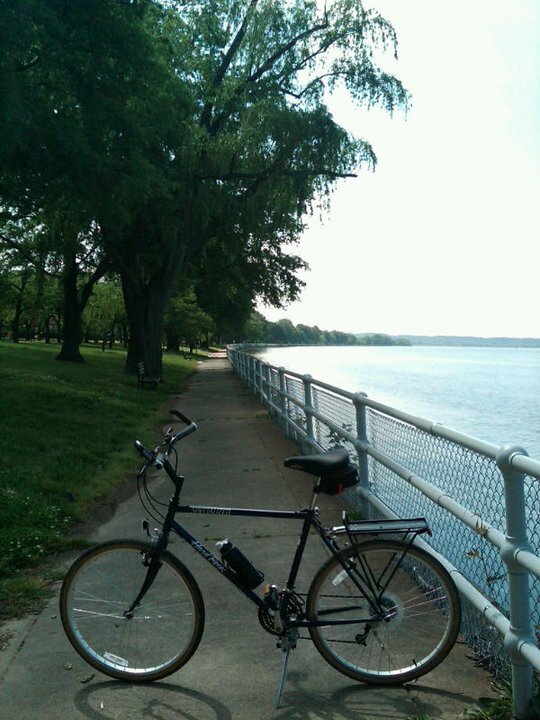 East Potomac Park is a section of Potomac Park located south of the Jefferson Memorial and the 14th Street Bridge, and sits on a peninsula that drives a grassy wedge between the Washington Channel and the Potomac River on the south side of the Tidal Basin (MAP). 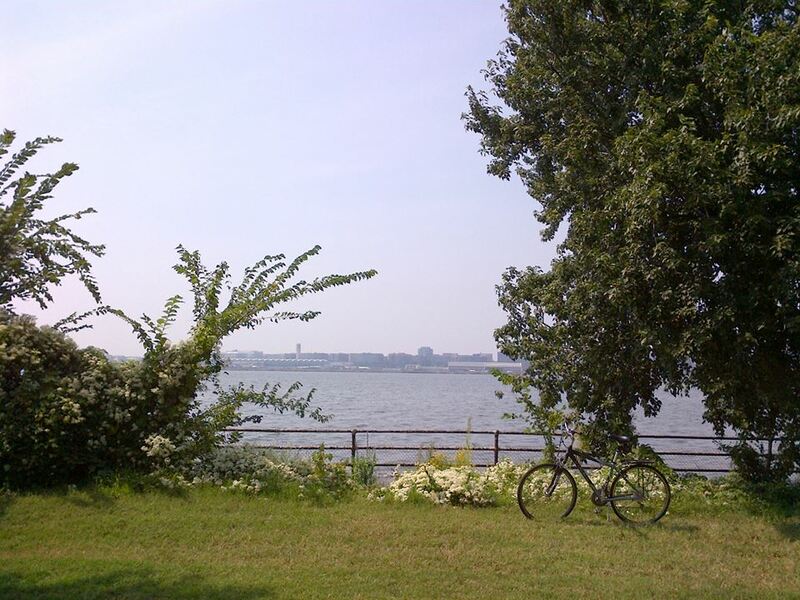 The 328-acre finger of land is bordered on the east by the Washington Channel, on the west by the Potomac River, Hains Point at the southern end, and is separated from West Potomac Park by the iconic Jefferson Memorial. The peninsula on which the park is located was created by the U.S. Army Corps of Engineers. After a disastrous flood in 1881, the Corps of Engineers dredged a deep channel in the Potomac and used the material to create the current banks of the river and raise much of the land near The White House and along Pennsylvania Avenue. Much of the dredged material was also utilized to build up existing mudflats in the Potomac River as well as sandbars which had been created by resultant silting, including the peninsula which led to the creation of Potomac Park on March 3, 1897. In addition to providing terrific views of the city, East Potomac Park also features many of Washington’s famous Kanzan cherry trees. These double-blossoming cherry trees line Ohio Drive and bloom about two weeks after the single-blossoming Toshino variety that attracts throngs of tourists to the cherry blossoms around the Tidal Basin during the National Cherry Blossom Festival each spring. 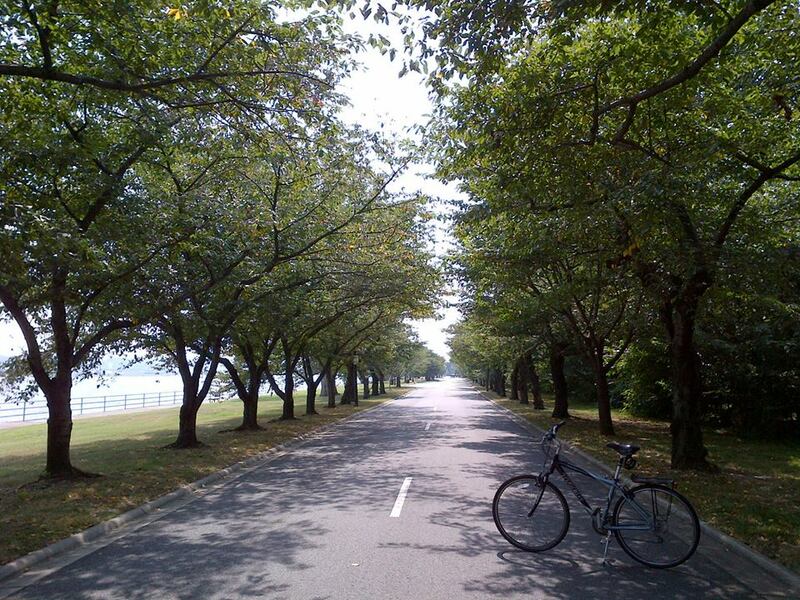 Ohio Drive, which is a six-mile loop that runs the perimeter of East Potomac Park, is a popular route with bicyclists, runners and walkers, and inline skaters. And a scenic riverfront sidewalk, which winds around the park’s shoreline, remains a popular place for fishing, despite falling apart and literally sinking into the river in places. 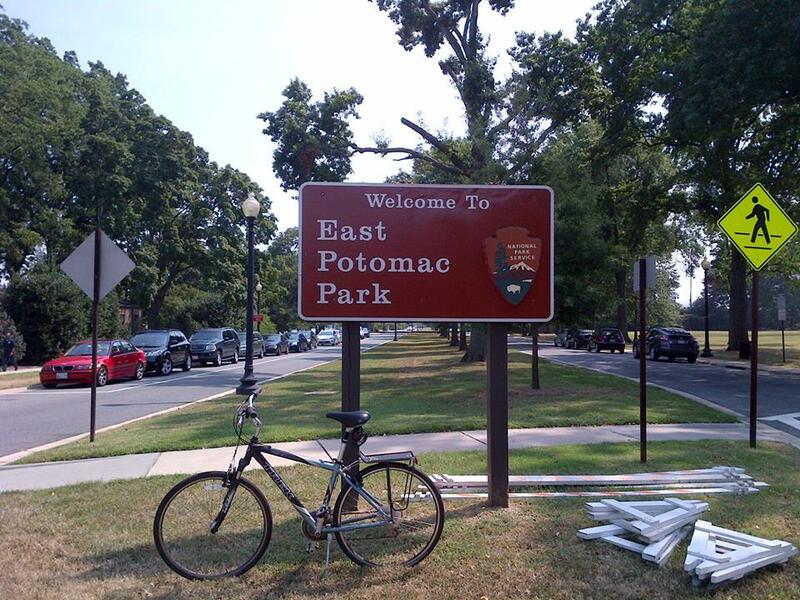 The park is also home to one 18-hole and two 9-hole public courses at the East Potomac Park Golf Course, a driving range and a miniature golf course, a public swimming pool (the East Potomac Park Aquatic Center), tennis courts, picnic facilities, a playground, and a recreation center. 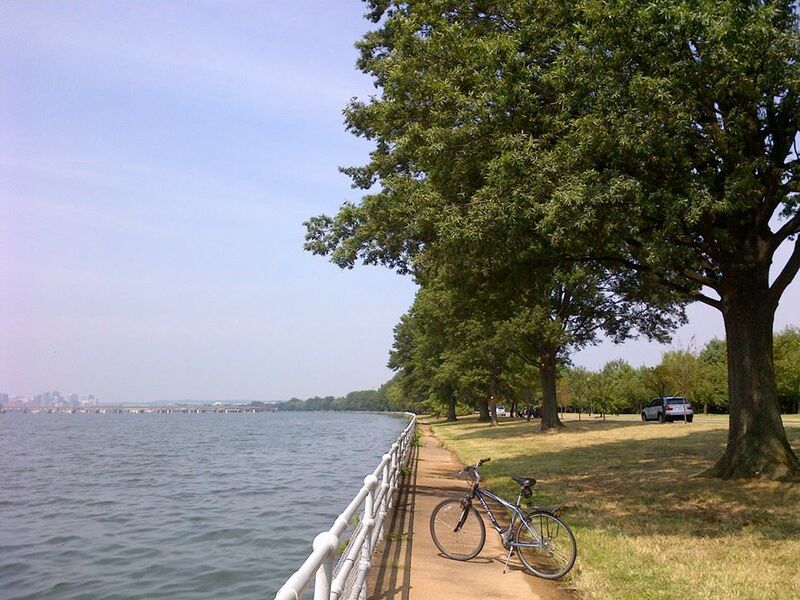 The southern end of the park at the end of the peninsula is known as Hains Point. This location offers stunning views of the river, as well as Fort McNair and the National War College in D.C. to the east. To the west, visitors can watch planes take off and land at Ronald Reagan Washington National Airport, located across the Potomac River in Virginia. 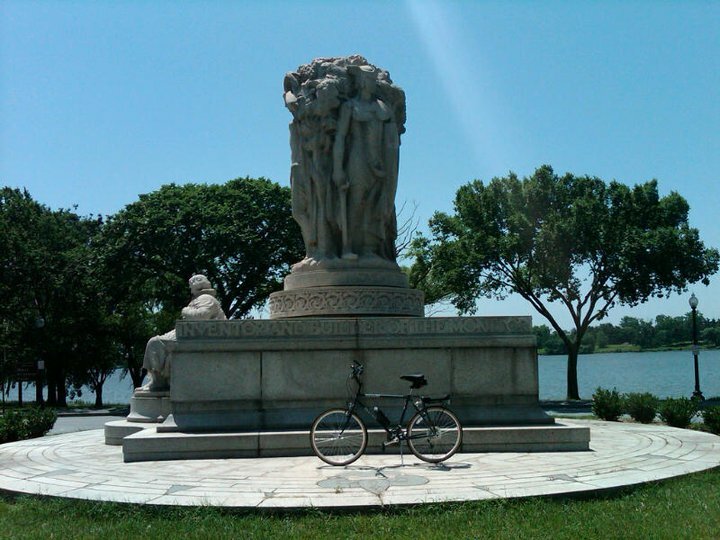 Hains Point was also formerly the home of a popular public artwork entitled “The Awakening,” a 70-foot sculpture depicting the arousing of a bearded giant who is embedded in the earth. However, the sculpture was sold in 2008, and the new owner moved it to its current location at National Harbor in Prince Georges County, Maryland. 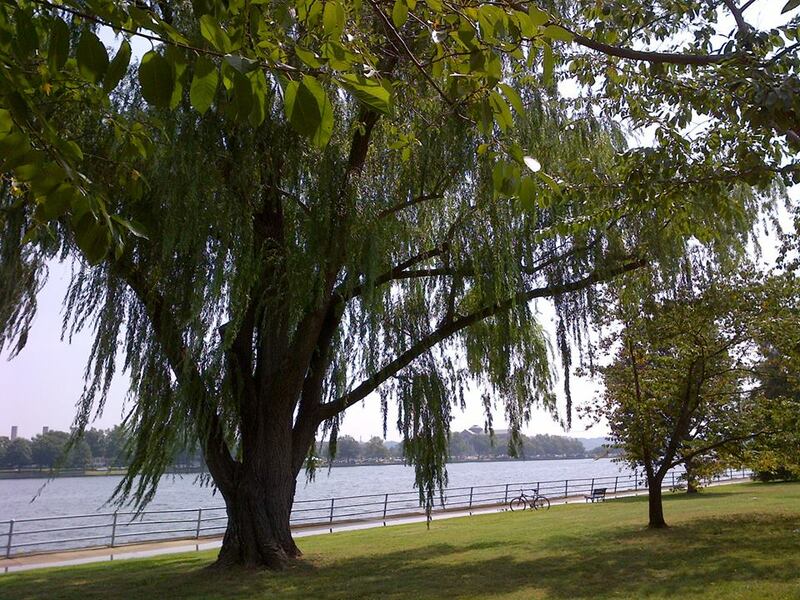 It is rare for anything in D.C. to lack controversy or intrigue, and East Potomac Park is no exception. In 2004, an area of four acres adjacent to the National Park Service offices at Ohio and Buckeye drives was enclosed by a 10-foot high security fence and large beige metal buildings were constructed. The action, initiated by the U.S. Navy, bypassed normal multi-agency review procedures usually required for the use or taking of Federal parkland. The Navy, which operates the site, calls the work a “utility assessment and upgrade” and will not say if the project is classified or whether it has a name. Nor will the Navy say how much it cost, how many people were on the job or why it was needed. Athough the Navy originally advised that work at the complex would last approximately four years, a decade later the ongoing activity and construction that goes on inside the security fence, involving regular arrival and departure of dump trucks, remains a mystery. Amid the secrecy, theories about the four-acre complex and hangar-like structures abound. 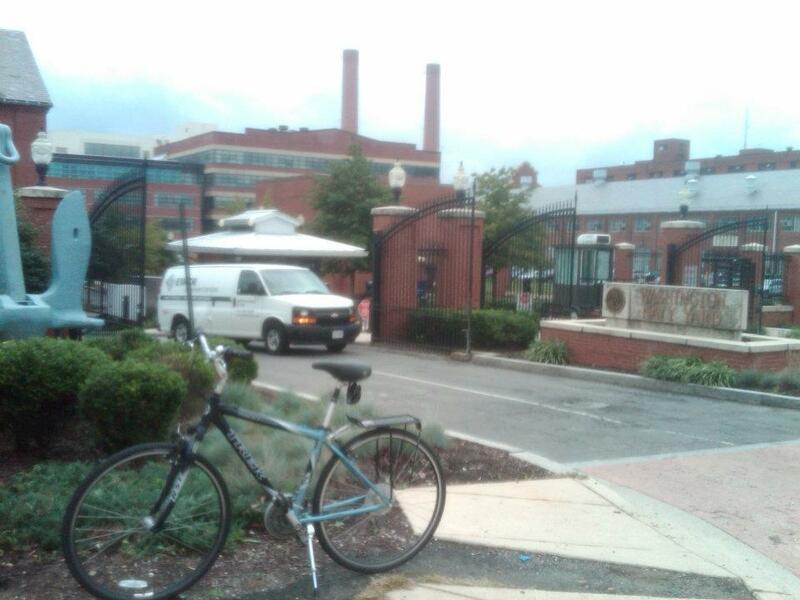 In a city which contains radiation tracking instruments atop the Federal Reserve building, biowarfare sensors analyzing the air on the National Mall in front of the Smithsonian Institution castle, and antiaircraft systems on a rooftop next to the White House, the Navy’s secretive activity on East Potomac Park is presumed by many to be related to national security. Although we may never know the details of the Navy’s activity there, that should not prevent visitors from enjoying the remaining 324 acres of this active yet pastoral park. 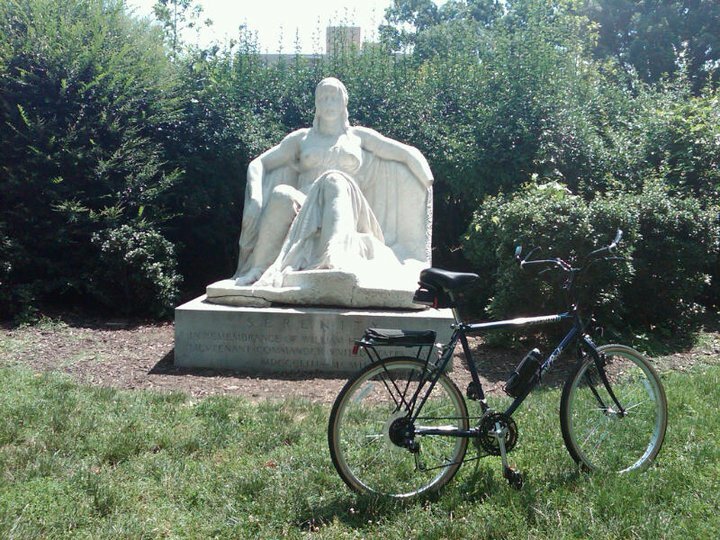 On this bike ride I chose to go to see a sculpture entitled “Serenity,” which sits in Meridian Hill Park, located in northwest D.C.’s Columbia Heights neighborhood on land bordered by 15th, 16th, W, and Euclid Streets (MAP). The large outdoor statue depicts a seated woman with a flowing robe over her lap, and her left foot resting on what appears to be a broken sword. Serenity was installed in the park’s northwest corner and dedicated on March 12, 1924. It is the work of a Spanish Catalan sculptor named José Clara, and is identical to the sculpture, “Serenidad,” which is known by the same name, only in Spanish for some reason, despite the fact that it is in Luxembourg, Germany. Serenity was originally owned by Charles Deering, an American businessman, art collector and philanthropist, whose family fortune was made through the agricultural equipment company that eventually became International Harvester. He bought the statue in 1900 at the Paris Exposition. As a tribute to the memory of a friend and classmate from the U.S. Naval Academy named William Henry Scheutze, Deering donated the statue to the National Park Service to be displayed publicly as a gift to the American people. Deering’s friend, Lieutenant Commander William Henry Scheutze, was a career naval officer. He graduated first in his class at the U.S. Naval Academy. He was part of an expedition to retrieve the bodies of American explorers who died in the Arctic, and later served in Siberia as a navigator, and on the U.S.S. Iowa during the Spanish American War. At the time of his sudden death, Scheutze had a desk job in D.C. as the superintendent of the compass division of the U.S. Navy. Other than the fact that Deering already owned the piece, I have no idea what the sculpture of a serene woman has to do with a deceased naval officer. 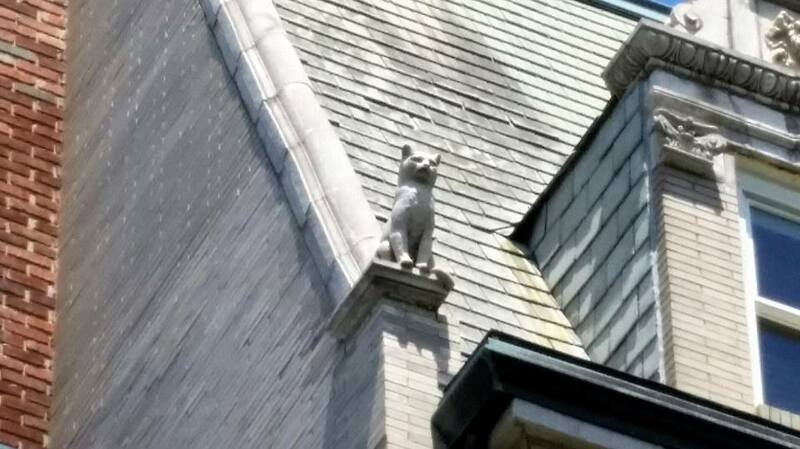 Unfortunately, the sculpture is in a state of disrepair. Her nose went missing in 1960, and by 2009 she was also missing her left hand and a big toe. She has been vandalized over the years with paint as well, although that has been cleaned up. 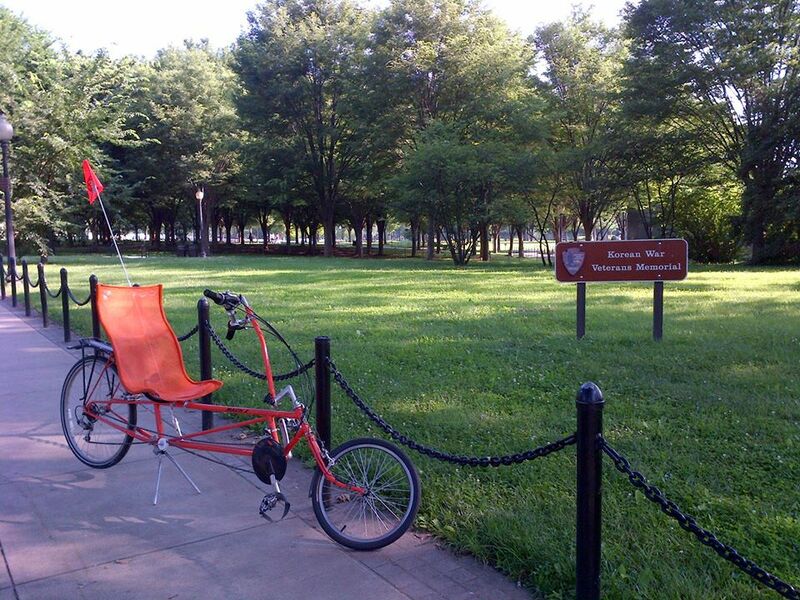 But it is nonetheless a nice sculpture, and worth seeking out, especially if you’re already visiting Meridian Hill Park. In 1820, Stephen Decatur, Jr., a U.S. Naval Officer notable for his long and celebrated career, was shot during a duel with another officer, Commodore James Barron. A long-time rival, Barron bore a grudge against Decatur for his role in Barron’s court-martial and ouster from the Navy years earlier. Attempting to solve the issue, Decatur accepted Barron’s challenge to a duel. Decatur shot and wounded Barron, as was his intention, and was prepared to let the matter drop. Barron, however, had other plans. He mortally wounded Decatur and exacted his revenge. Decatur was taken to his home, where he didn’t die straight away, however. It took him two days of agonizing pain to finally succumb to the gut-shot. It’s notable that their duel occurred during a time period when duels between officers were so common that it was creating a shortage of experienced officers, forcing the War Department to threaten to discharge those who attempted to pursue the practice. Washington society, as well as the entire nation, was shocked upon learning that Decatur had been killed in a duel with a rival navy captain. His funeral was attended by Washington’s elite, including President James Monroe and the justices of the Supreme Court, as well as most of Congress. Over 10,000 citizens of Washington and the surrounding area also attended his funeral to pay their last respects to the national hero. 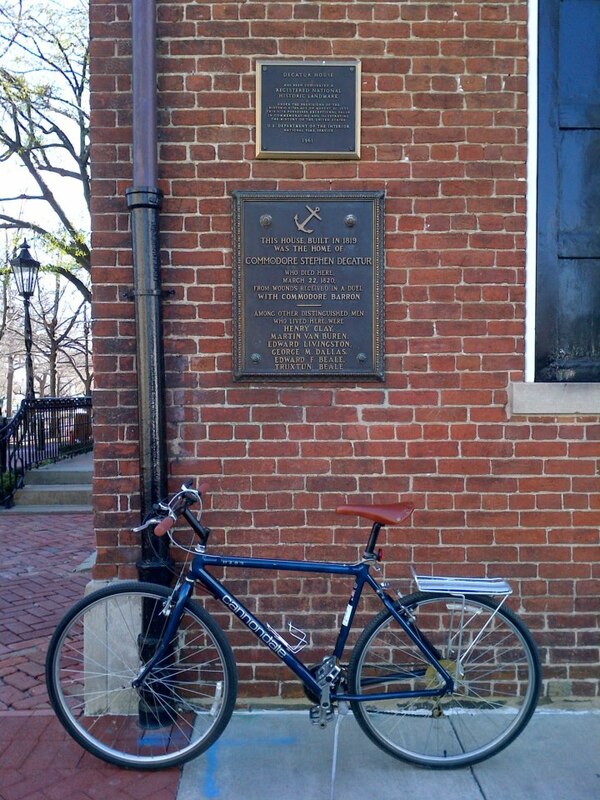 On today’s bike ride I went by Decatur’s former home. 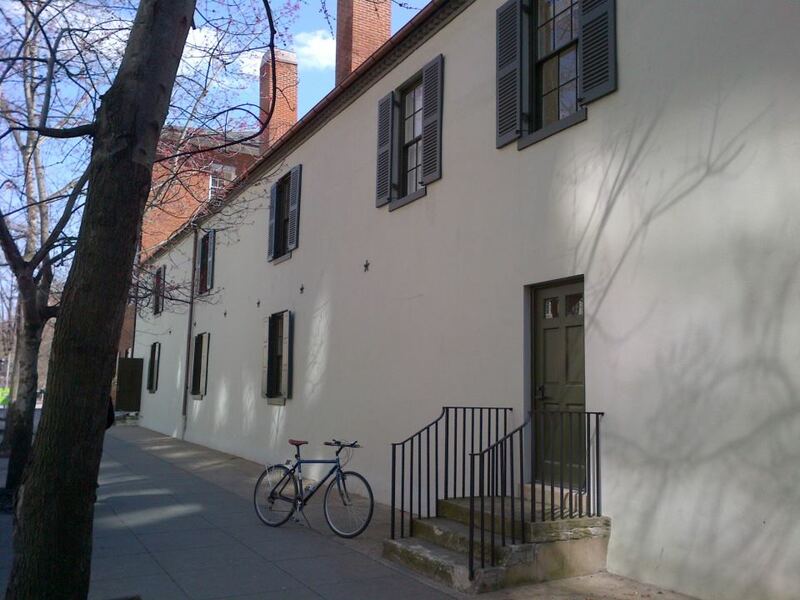 Located at 1610 H Street in northwest D.C. (MAP), the house is one of the oldest surviving homes in D.C., and one of only three remaining houses in the country designed by neoclassical architect Benjamin Henry Latrobe, the “father of American architecture.” In D.C., Latrobe also designed St. John’s Episcopal Church (also known as the President’s Parish) and parts of The White House. 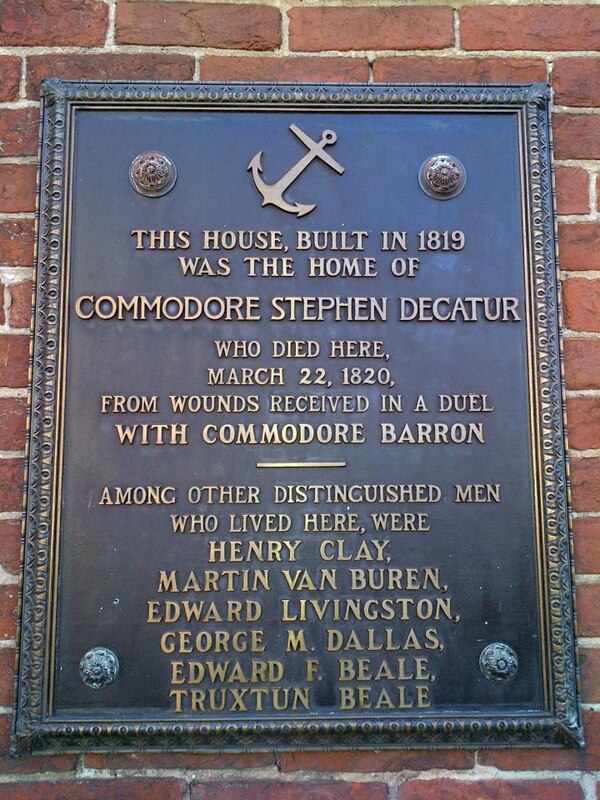 The Decatur House was built with the prize money Decatur was awarded for his naval conquests in the War of 1812. 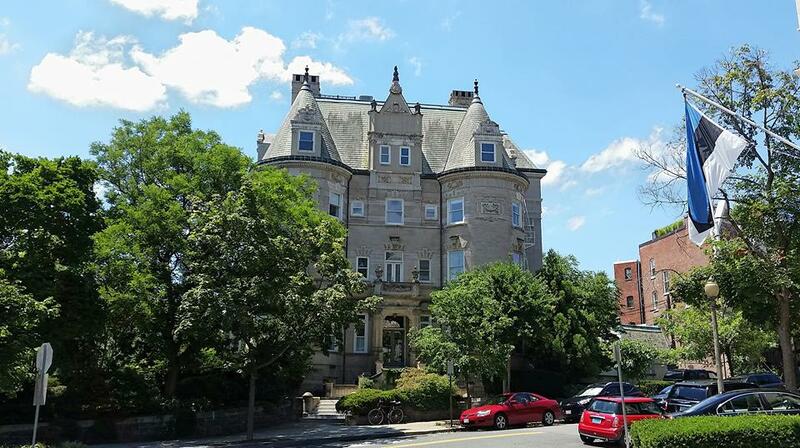 The couple moved into their grand house in 1819 and spent the first several months cementing their social prominence in Washington by hosting a number of extravagant parties. 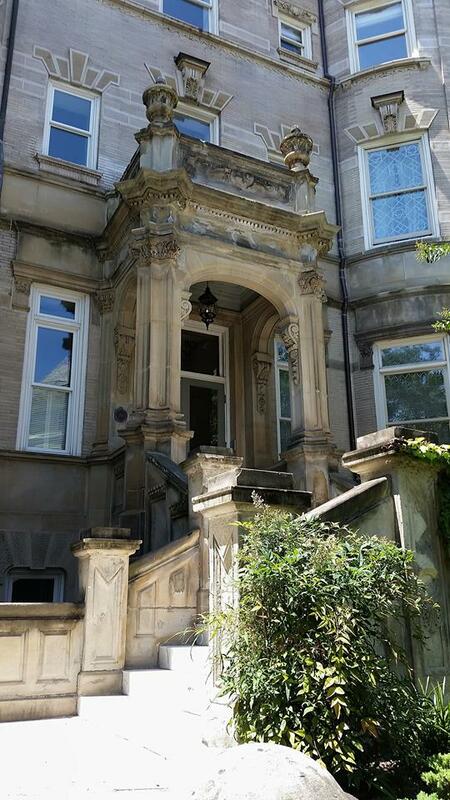 Prominently located on Lafayette Square just north of the White House, the house was later the home of a number of other famous people, including President Martin Van Buren, who rented it from Decatur’s widow. Despite leaving her financially well-off at the time of his death, his widow was eventually forced to sell the home due to overwhelming debt. The subsequent owner built an addition onto the house – a large two-story dependency building at the rear of the property. This was used as quarters for the numerous enslaved individuals in his household. 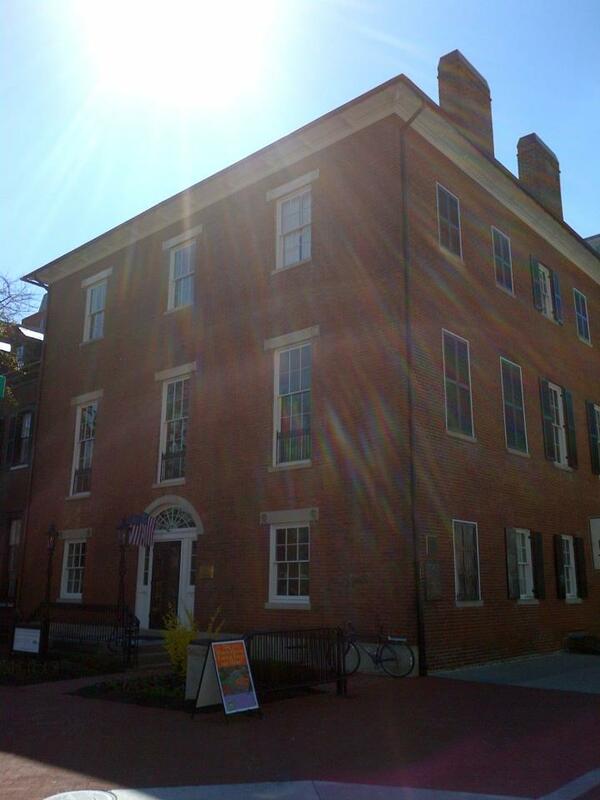 Sometimes referred to as a house of slavery and death, Decatur House is considered among paranormal enthusiasts to be one of D.C.’s most haunted. Those who have been in the house frequently claim to have seen Stephen Decatur walking the halls, his expression one of bleak sadness. He has been sighted throughout the house. 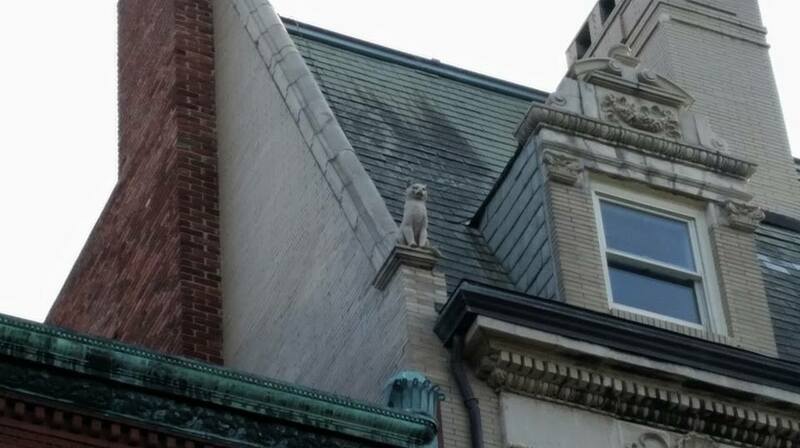 And though he is often seen looking out windows or walking the halls, he is not the only phenomenon to take place. There are also reports of a mournful weeping and wailing sound that comes from empty rooms or is heard after hours. While no one is certain just who it is, most people believe the voice to belong to Decatur’s widow, Susan. The most palpable phenomenon is the feeling of sadness and heaviness that comes from the room on the first floor where Decatur died. 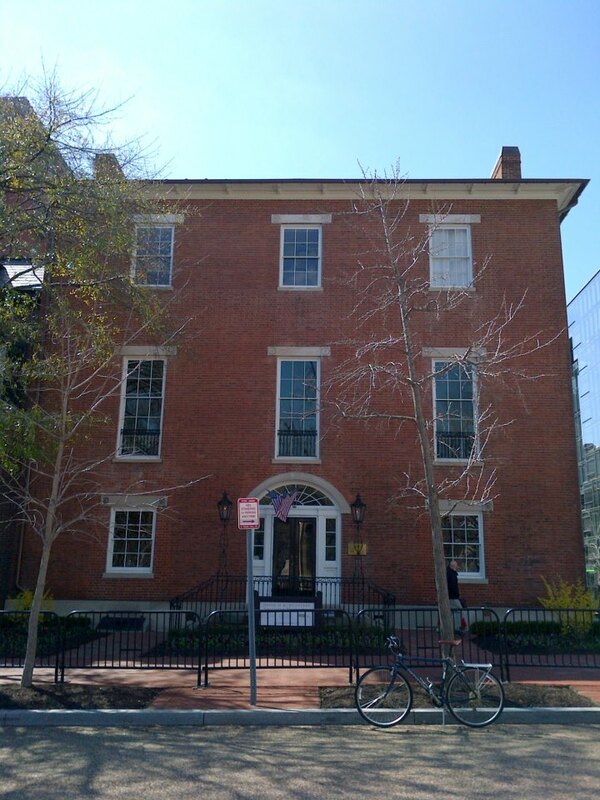 As with many historical homes, the house is now a museum and houses The Decatur House National Center for White House History, a repository for all things having to do with the home of the President. 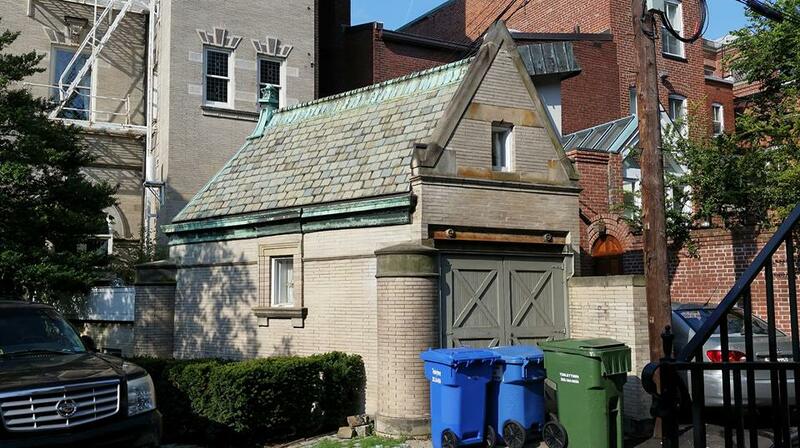 It is owned by the National Trust for Historic Preservation. 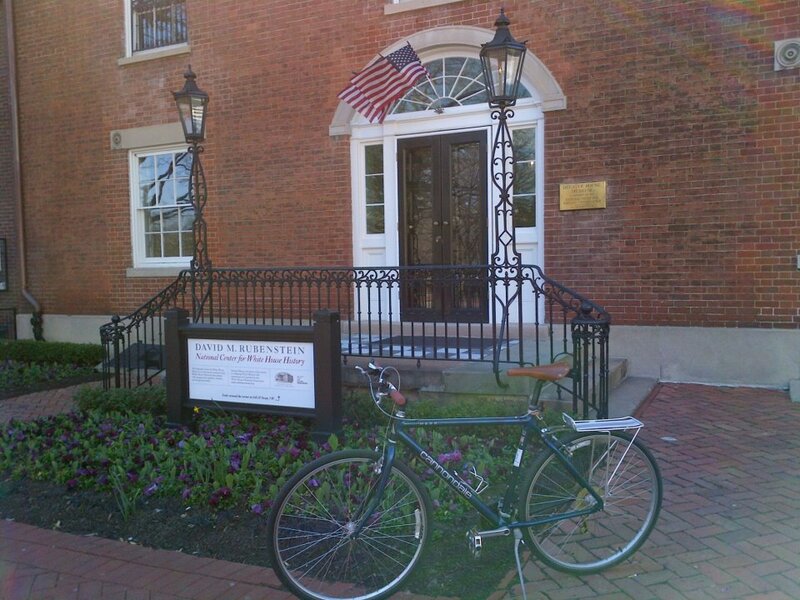 It is also open for historic tours of the house as well as self-guided tours of exhibits and even cell phone tours in which visitors are guided by calling the museum’s tour number. Additionally, the house is also available to host weddings and other special events, keeping in the tradition that Stephen and Susan Decatur started almost 200 years ago. 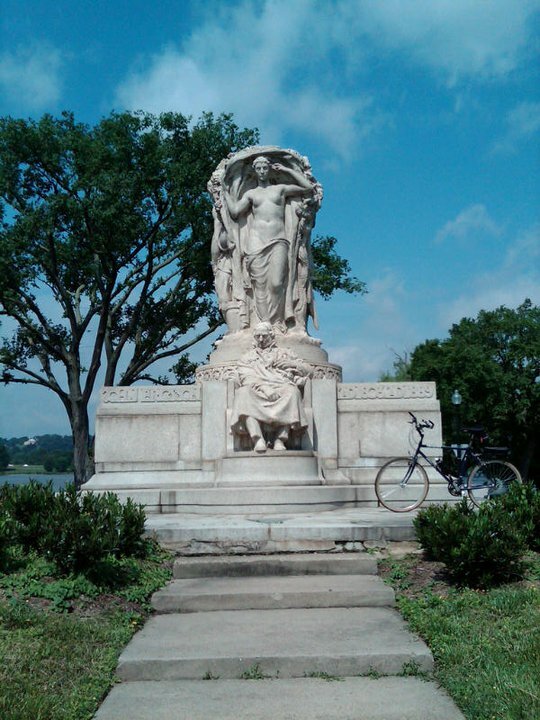 When riding in West Potomac Park on the Rock Creek Park Trail which runs along the North shore of the Potomac River, you will find the John Ericsson National Memorial, which is located near the National Mall at Ohio Drive and Independence Avenue in southwest D.C. (MAP). The memorial is dedicated to the Swedish-born engineer-inventor who is best known for his work during the Civil War when he transformed naval warfare through his design of the iron-plated USS Monitor, the ship that ensured Union naval supremacy. 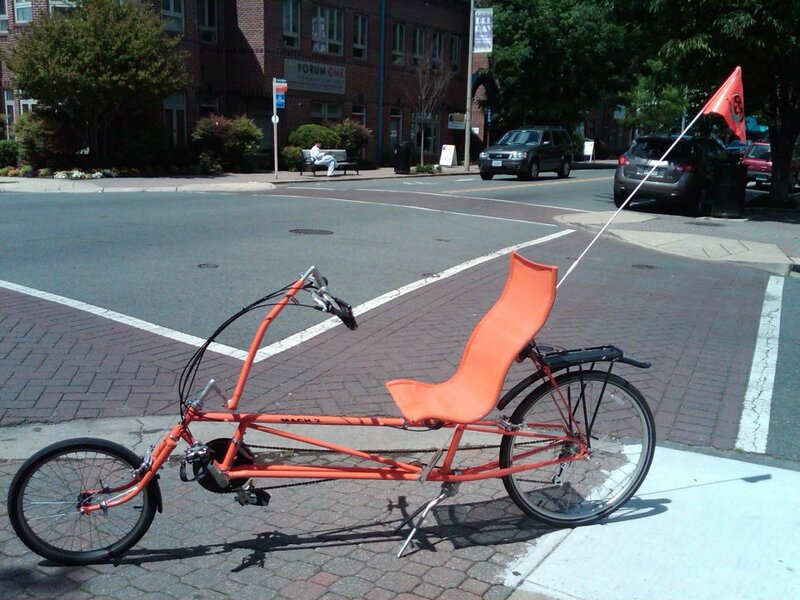 He also revolutionized maritime history with his invention of the screw propeller. Later Ericsson designed other naval vessels and weapons, including a type of torpedo and a Destroyer, a torpedo boat that could fire a cannon from an underwater port. 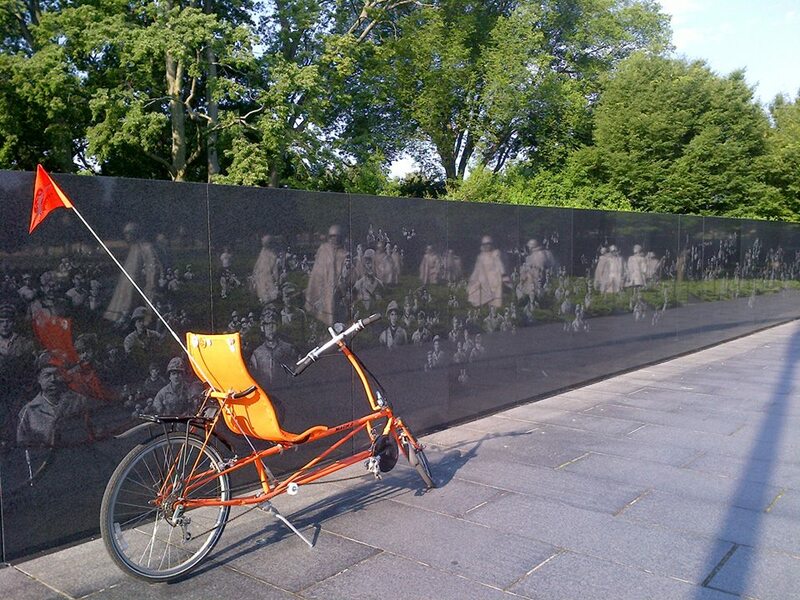 The memorial was originally authorized by Congress in 1916, and was completed a decade later. 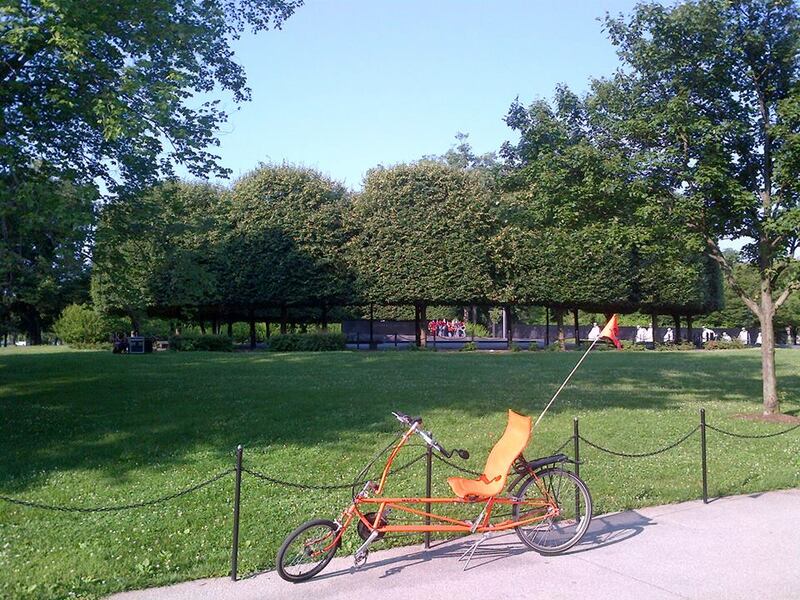 It was dedicated in 1926 by President Calvin Coolidge and Crown Prince Gustaf Adolf of Sweden. Congress appropriated just over half the cost of creating the memorial, with the remainder being raised privately by Americans chiefly of Scandinavian descent. 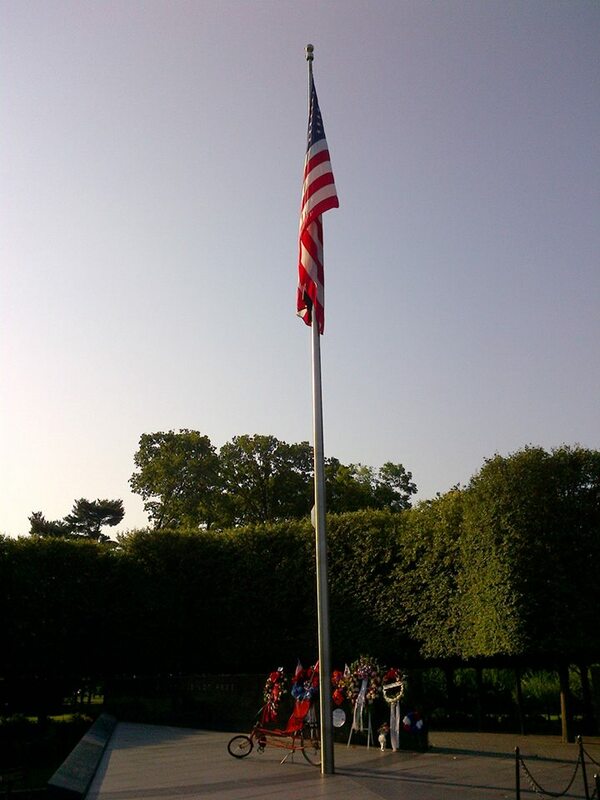 The memorial is constructed out of pink Milford granite, and measures 20 feet high with a 150-foot diameter base. It features a seated figure of Ericsson in the front, and three standing figures behind him. These figures represent adventure, labor, and vision. 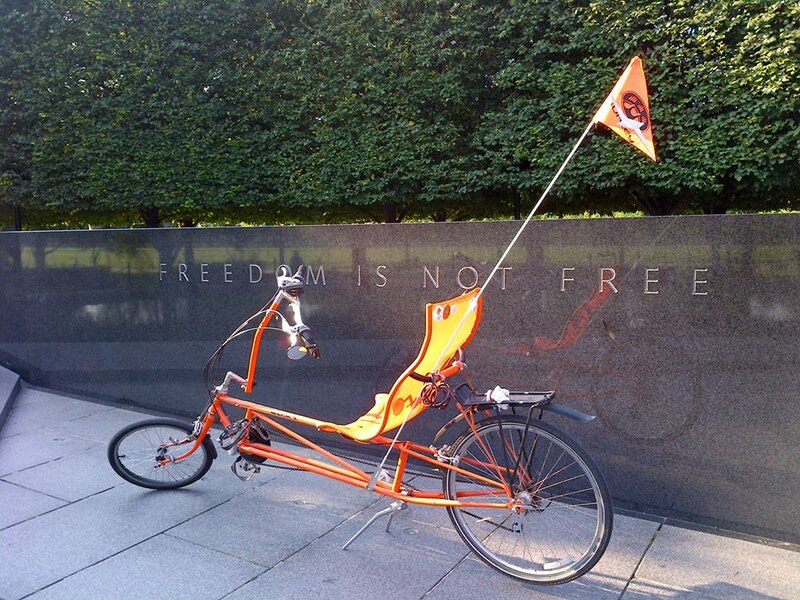 It is maintained by the National Mall and Memorial Parks (also known as National Capital Parks-Central), which is an administrative unit of the National Park Service encompassing many national memorials and other areas in D.C. The statue is part of a group of statues entitled “The Civil War Monuments in Washington, D.C.” which are spread out through much of the central and northwest areas of the city. They are listed as a group on the National Register of Historic Places. Although none of his inventions created any large industries, he is regarded as one of the most influential mechanical engineers ever. Ericsson died on March 8, 1889, the anniversary of the famous Battle of Hampton Roads of which his famous Monitor played a central role. 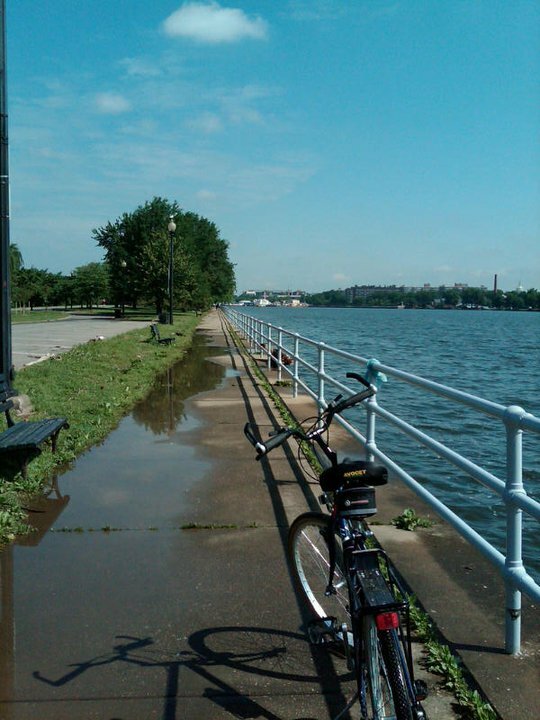 If you go for a bike ride along D.C.’s southwest waterfront, and I highly recommend that you do, you should proceed east on the Anacostia Riverwalk Trail until you get to the waterfront at The Washington Navy Yard. Located on the north shore of the Anacostia River just east of Nationals Park, you will find the Navy’s oldest shore establishment. 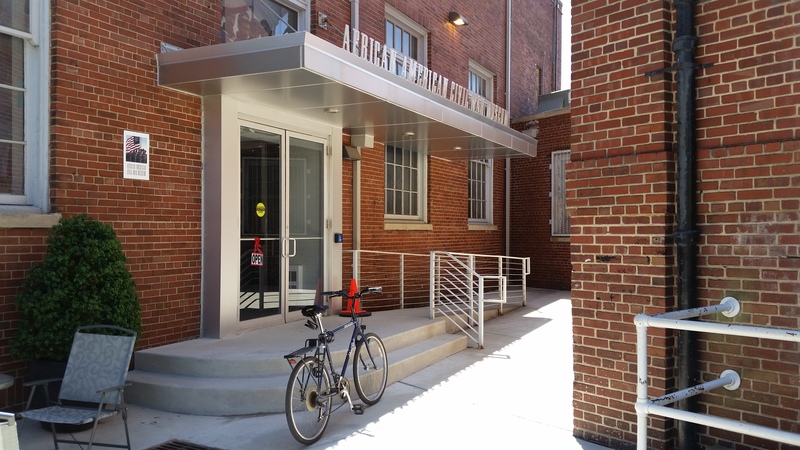 Known as “The Yard,” it is the former shipyard and ordnance plant of the U.S. Navy in southeast D.C., and currently serves as a ceremonial and administrative center. On the waterfront at The Yard you will find the USS Barry (DD-933) moored at Pier 2 (MAP). She was one of the Navy’s eighteen Forrest Sherman-class destroyers when commissioned in 1954. She supported the 1958 Marine and Army airborne unit landing in Beirut, Lebanon. And in 1962, she participated in the Cuban Missile Crisis as a member of the task force that quarantined Cuba in response to evidence that Soviet missiles had been installed on the island. She spent most of her career in the Caribbean, Atlantic, and Mediterranean, but also served in the Vietnam War, for which she was credited with destroying over 1,000 enemy structures and earned two battle stars. During the final portion of her active career, in the 1970’s, she was home ported in Athens, Greece as part of the Navy’s forward deployment program. Decommissioned in 1982, she began her new career as a museum ship and permanent public display two years later when she was brought to The Yard. She currently lies moored in the Anacostia River and serves as a distinctive attraction for visitors to the historic area, with some of her internal areas opened for visitors to tour. Some of the museum ship’s areas open for viewing include the machine repair shop, the crew berthing room, the ward room, the mess deck, the bridge, and the combat information center. She is also used for training and shipboard familiarization, and as a ceremonial platform. Many local residents think the ship was named after “D.C. Mayor-For-Life” Marion Barry, but she was actually named for the illustrious Revolutionary War naval hero, Commodore John Barry. An officer in the Continental Navy during the American Revolutionary War and later in the United States Navy, John Barry is widely credited as “The Father of the American Navy,” sharing that moniker with John Paul Jones. As most naval historians note, Barry can be classed on a par with Jones for nautical skill and daring, but he exceeds him in the length of service to his adopted country and his fidelity to the nurturing of a permanent American Navy. He had great regard for his crew and their well being and always made sure they were properly provided for while at sea. Barry was also a religious man, and began each day at sea with a reading from the Bible. I have been to the waterfront at The Yard several times, and each time I practically had the place to myself. 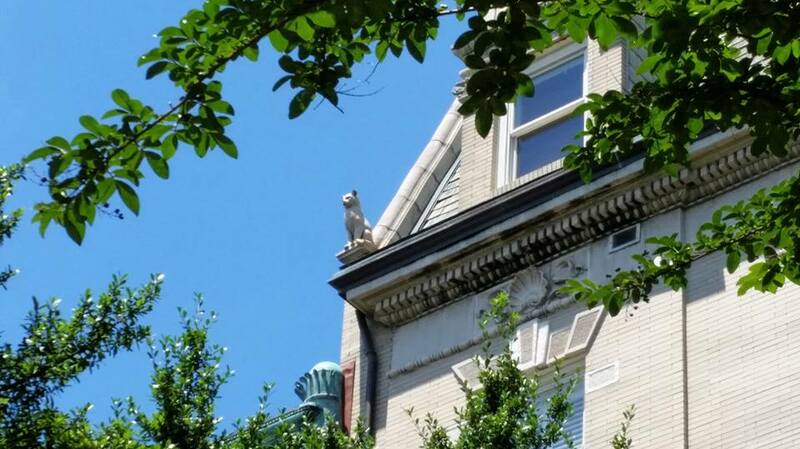 It is one of D.C.’s true hidden gems. And although I know there are some people who’d prefer to keep it that way, this is another place worth knowing about and visiting that is just too good not to share. 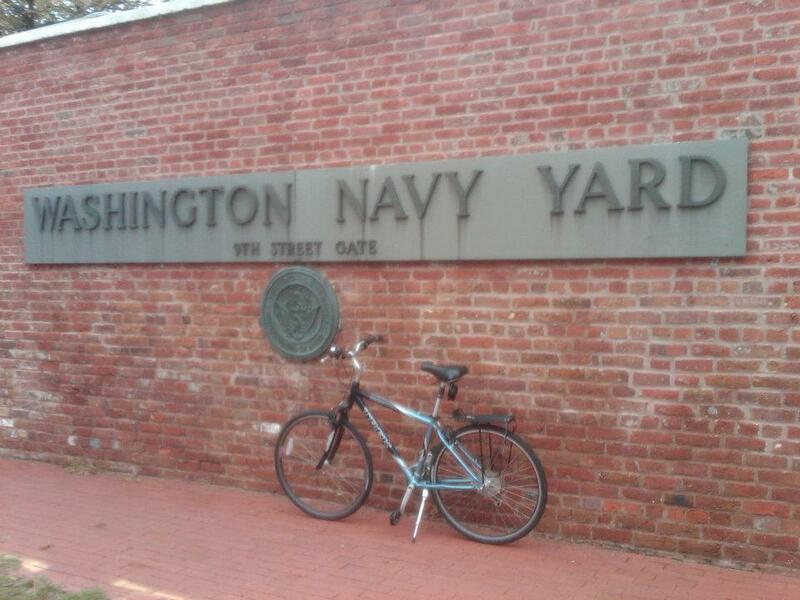 UPDATE: Unfortunately, after 34 years in D.C., the USS Barry is no longer at the Washington Navy Yard. Unable to move under its own power since the ship’s internal systems were in layup and out of commission, on May 7, 2016, tugboats towed the ship to Philadelphia, where it was dismantled and sold for scrap.